A powerful gated fuzz with a range of features to animate it either statically or in performance. Harmonically-rich fuzz tones. Adjustable modulation and OSC. Fun. The ethos of London-based Rainger FX is that pedals should sound great, be totally reliable and fun to use. 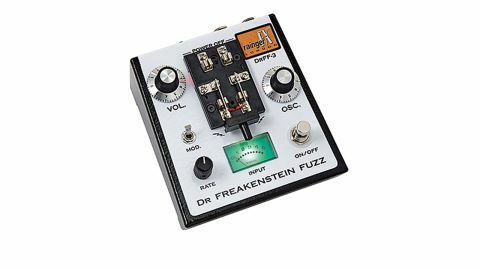 The Dr Freakenstein Fuzz DrFF-3 fulfils those criteria. "This pedal delivers glorious, harmonically-rich fuzz, albeit via a noise gate"
This pedal won't even power up unless you engage the laboratory-style knife switch, bringing life to the monster. And a monster it is: this pedal delivers glorious, harmonically-rich fuzz, albeit via a noise gate, so you get silence between notes; but you need to have the guitar volume max'd and play carefully to avoid unwanted sonic artefacts. An OSC knob, which controls the harmonic overtones, is effectively a tone control for the fuzz and for dialling in a low octave via a hi/lo switch that offers two different fuzz voices. There's also adjustable modulation for the OSC for sweep or tremolo effects. The doctor has an assistant named Igor, too: a foot-controlled pressure pad that you step on to tweak the OSC or the modulation range, so filter sweeps, wah-like effects, bringing the low octave in and increasing modulation, are all possible.